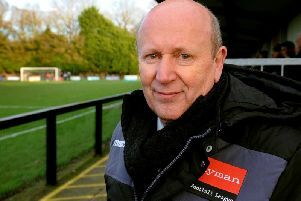 Burgess Hill Town manager Ian Chapman has pledged his future to the club despite an offer from a club in a higher league. The Hillians avoided relegation on a dramatic last day of the season when Sam Fisk’s late goal gave them the win they needed against Merstham. And after a short break, Chapman is back to business and is committed to carrying on his journey at Burgess Hill Town and making sure they progress next season. Chapman revealed to us he was approached by another club but he said: “I want to be at Burgess Hill Town and I honestly believe if we keep the players we had at the end of last season it will be good. He added: “The budget is open to discussion. I met with Kevin after the season for a bit of lunch, just me and him, and we discussed how we take the club forward and where we are going. “I have a two-year contract here and in the summer I got offered a job from a higher club again. “I am under contract and me and Kevin are very open with each other and I wanted to make sure we know where we are going. “It’s difficult. There is speculation all the time. I think with what we are, we do a good job with the budget and everything else. I just want to make sure we are on the same hymn-sheet. Burgess Hill hold their presentation night tomorrow (Friday) and Chapman is hoping to seal a few deals with the current crop of players. And although Chapman and his team just avoided the drop, the enthusiastic boss looked back positively at what the club achieved last season. He said: “Last season was supposedly a difficult season but it was our highest ever finish and we equalled our best ever cup run. He added: “People have got to understand where we are as a football club. I went to a parade on Sunday for a club (Brighton and Hove Albion) who are not going to have the joys next season as they have this season. “And it’s going to be massively important the crowd sticks behind them and help them because it is going to be difficult. “For us it’s on a much smaller scale but it’s the same. “We went up a league and this is going to be our third season in this league and that is a feat on its own. “When I first came to this club five seasons ago we just finished second from bottom in the league below where we are now. “You have got have an appreciation of where you are going. “Clubs in the past have moved quickly but with substantial financial backing.